At the Destination step of the wizard, select failback destination. Veeam Backup & Replication supports three possible failback destination variants. Note that the Failback wizard displays a different set of steps for every failback variant. Select Failback to the original VM if you want to fail back to the original VM residing on the source host. In this case, Veeam Backup & Replication will restore the original VM to the current state of its replica. If this option is selected, you will pass to the Summary step of the wizard. 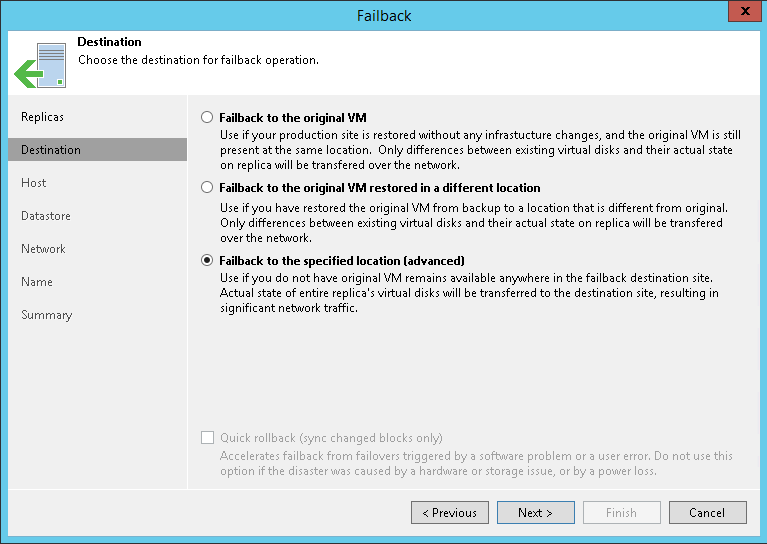 Select Failback to the original VM restored in a different location if you have recovered the original VM from a backup in a new location, and you want to switch to it from the replica. In this case, Veeam Backup & Replication will restore the recovered VM to the current state of the replica. If this option is selected, you will pass directly to Target VM step of the wizard. Select Failback to the specified location (advanced) if you want to restore the original VM from a replica in a new location and/or with different settings (such as VM location, network settings, the format of restored virtual disks and so on). If you fail back to the original VM or to the original VM restored in a new location, only differences between the existing virtual disks and their state will be transferred over to the original VM. Veeam Backup & Replication will not transfer replica configuration changes, such as a different IP address or network settings (if replica Re-IP and network mapping were applied), new hardware or virtual disks added while the replica was in the Failover state. If you choose to perform advanced failback, the entire VM replica, including its configuration and virtual disks content, will be restored in the selected location.